Let journalist Marianne Lie Berg guide you to her favourites amongst Norway’s more quirky hotel alternatives. Let journalist Marianne Lie Berg guide you to her favorites amongst Norway’s more quirky hotel alternatives. Spend your nights in personal interpretations of the usual hotel concept. Journalist Marianne Lie Berg, a highly respected contributor to Norwegian media when it comes to design and architecture with a fresh twist, will help you make your holiday even more special. Start planning your trip to some of Norway’s cheerful one of a kind dwellings. 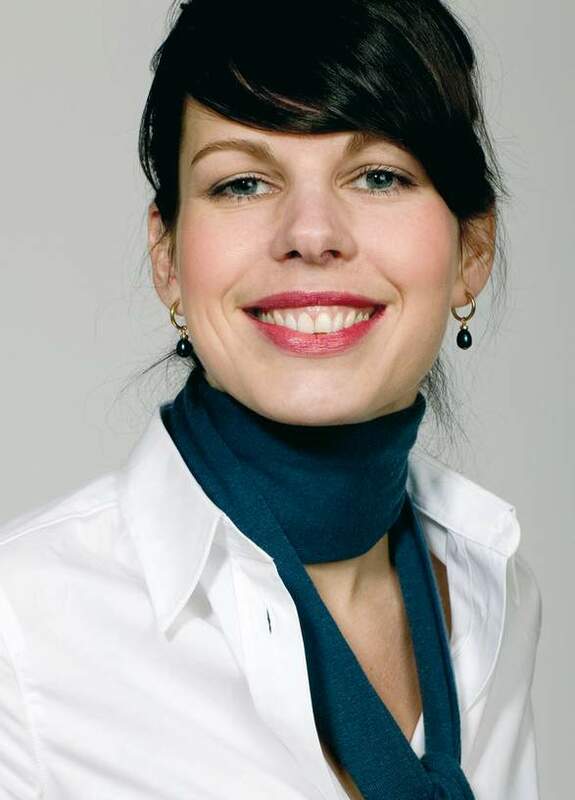 Experienced journalist, writer, and editor who contributes with weekly articles to several established Norwegian media houses. 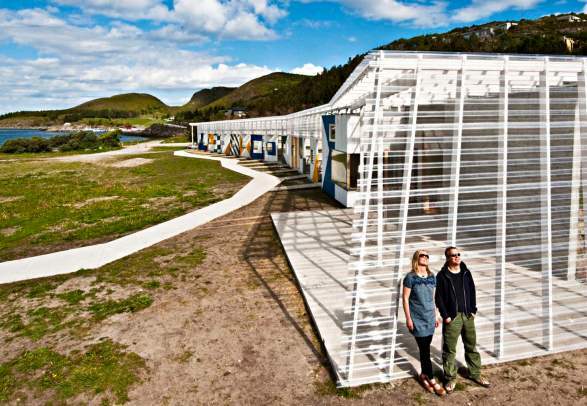 In the county of Trøndelag in the middle of Norway you will find Stokkøya sjøsenter, designed by the architects’ office Pir II arkitekter. The individual rooms are placed together to form a fan shape in order to create a social vibe and a modern take on the classic cabin feeling. Head east across the fjord from the Lofoten Islands to find the airy seaside cabins of Manshausen balancing neatly on the Steigen coastline. The modernistic shapes are signed Stinessen Arkitektur. Juvet Landskapshotell is naturally designed around the waterfall of Gudbrandjuvet in the mountains close to the Geirangerfjord. Huge window surfaces are completely erasing the distinction between inside and outside. 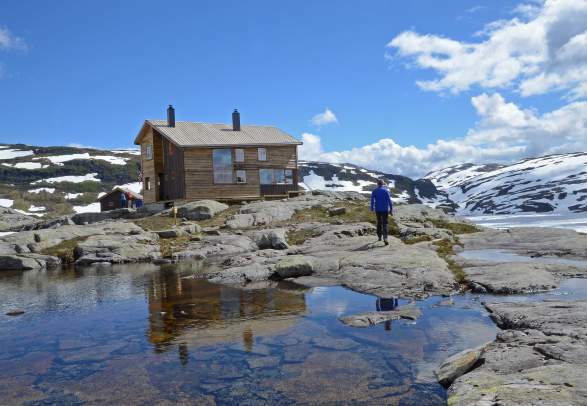 Skåpet consists of seven self-service cabins owned by The Norwegian Trekking Association (DNT), known for its numerous lodges in remote hiking areas. In recent years, the Association has built several cabin complexes with a modernistic approach. 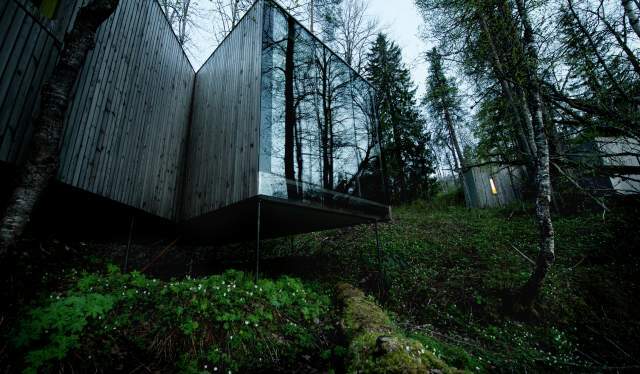 Skåpet lies in the hiking area near the Lysefjord, and the cabins are good examples of the trend. If you want to spend a night or two there, you should book way in advance. Rabothytta, situated at 1,200 metres on the edge of the Okstindbreen glacier, is the work of the architects’ office Jarmund & Vigsnæs. The architecture mimics the mountainous surroundings and is built with local materials. The result is downscaled luxury. Rabothytta, situated at 4,000 feet on the edge of the Okstindbreen glacier, is the work of the architects’ office Jarmund & Vigsnæs. The architecture mimics the mountainous surroundings and is built with local materials. The result is a downscaled luxury. The ski resort of Myrkdalen in Voss is a destination for hiking enthusiasts in both summer and wintertime. The distinctive shape of the Myrkdalen mountain condominiums fits the mountain landscape and is signed by the architects’ office Jarmund Vigsnæs. Many travellers come to experience the widely popular mountain plateau of Preikestolen (the Pulpit Rock). The mountain lodge at the start of the path leading to the viewpoint is, like the plateau itself, aesthetically interesting. Many travelers come to experience the widely popular mountain plateau of Preikestolen (the Pulpit Rock). The mountain lodge at the start of the path leading to the viewpoint is, like the plateau itself, aesthetically interesting. Canvas hotel in Telemark in Southern Norway is a new-thinking concept with accommodations somewhere between glamping and design hotel. Never mind that your room looks more or less like a desert tent – here you will quickly get used to the mix of diverse interior exotica. Hoel guest farm in the county of Hedmark is an example of how far one can take the idea of indulgence and luxury at a location that was originally a stately farm. Attention to detail goes hand-in-hand with a great sense of a steady, era-wise interior scenography. The farm also has a private quay for the nationally famous paddle steamer Skibladner. If the house of your dreams is still your childhood’s treehouse, you should check out Kraggbua in Engerdal. This small-scale wooden hotel room combines the charm that you remember with modern comfort for grown-ups. Lighthouses are the new thing in accommodation. Their attraction lies both in the charming intimacy of their narrow constructions and in their harsh, weathered locations at the outermost islands against the open ocean. Find peace through the changing special light of the open landscape of Eresfjord. The down to earth construction of the Øverås cabins seems to part of the nature, with their pleasing approach to classic, Norwegian wooden architecture and large window surfaces that invite the nature indoors. There is no need to wait until you’re here to find out where you’d like to stay.